September 24, 2013 By Allyson 6 Comments This post may contain affiliate links. Read my disclosure policy. I am so excited to be joining forces with Plaid, and sharing their new FolkArt Multi Surface Paint and brand new line of stencils by Handmade Charlotte! Both will be available for purchase in Michael’s stores soon! Make sure you read all the way through this post as you will have a chance to win a $100 gift card to Michaels and a gift pack of this amazing FolkArt Multi Surface Paint!!! 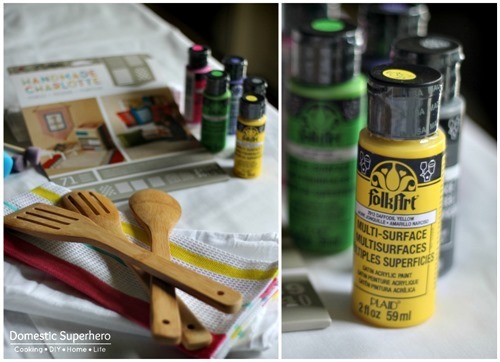 I was thrilled to hear about this new Multi Surface Paint by FolkArt. I love their regular paints, and now this new product is even more versatile. It can be used on pretty much any surface (glass, fabric, wood, metal, etc), and it is dishwasher and washing machine safe! Doesn’t get much better than that! Then when I saw the new stencil designs by Handmade Charlotte, I was seriously swooning. When I received my box of goodies from Plaid, I was shocked to see my favorite combination….grey, yellow, and chevron!!?!?!? 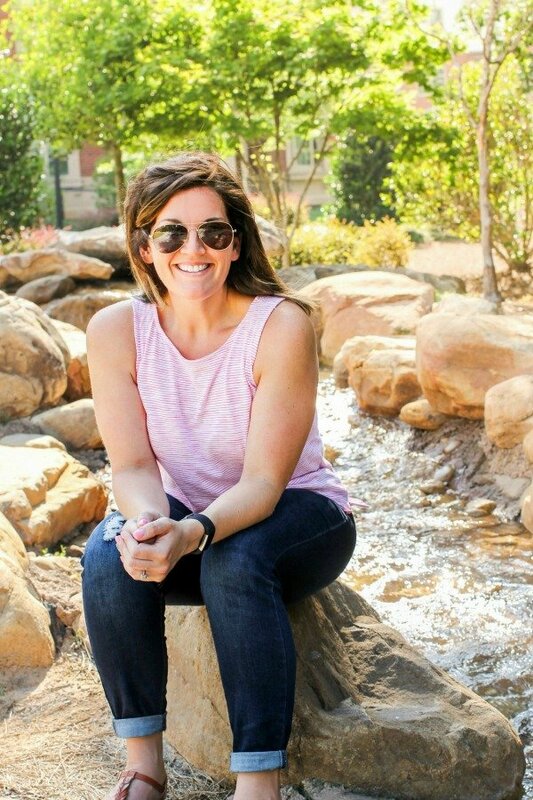 If you know me (or know my blog), you know I just love these 3 things…especially together! 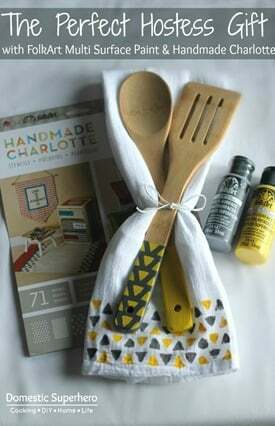 All I needed to pick up for this project were some white dishtowels and a set of wooden spatulas/spoons. I decided to make 2 sets, and try out one of the other stencils as well. I loved the little triangle pattern so I gave that one a try too! 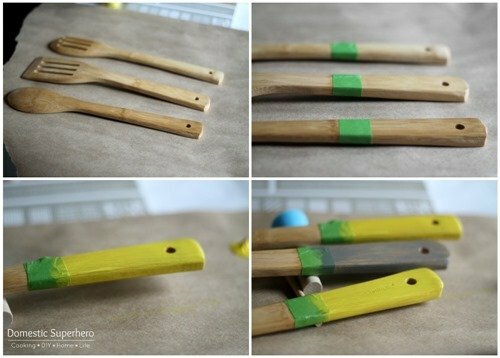 Layout your spoons, and then tape off where you want the paint to stop. This will give you a crisp clean line. 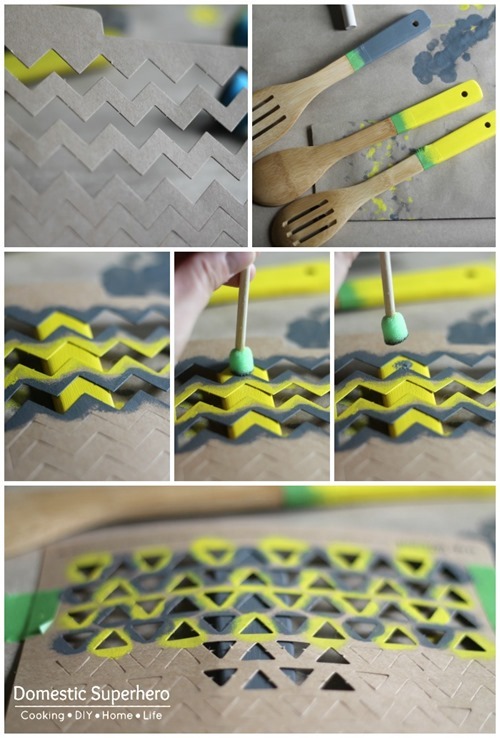 Use paint and cover the end of the spoons with desired color (yellow and grey!). I did 3 coats, because I wanted the coverage to be heavy. After the paint on the handles was dry, I taped the stencil over the handle, and then painted with the opposite color. One key thing I learned while stenciling my dining room, is that you have to dab off a lot of the paint before you put it on the stencil. This helps with getting crisp clean lines, and avoids the paint from running under the stencil etc. Dip the brush lightly in the paint, dab off paint, and then dab onto stencil. Repeat until you have desired coverage. Also, these little foam round brushes are a MUST for stenciling. Next it was time for the towels! I figured out where I wanted the design, and then I folded the towel and placed a piece of cardboard under it so the paint didn’t bleed through the top fabric layer to the rest of the fabric. Then I taped the stencil in position over the towel, and began painting. These were totally simple and I did about 3 coats on these as well, because I wanted the paint to be pretty bold. Tie them together with some cute string, twine, or ribbon and you are good to go! Ready for the big $100 and FolkArt giveaway?!?! Like stenciling? 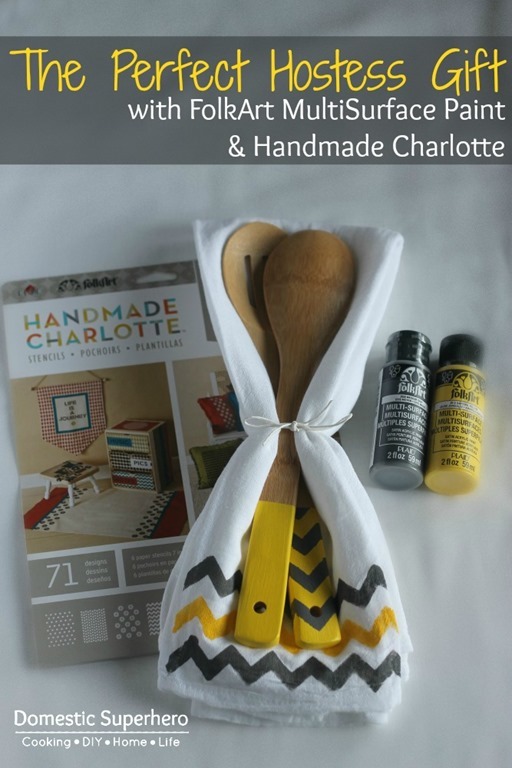 Handmade Charlotte is having a big challenge right now, and the grand prize is amazing!! Check it out here! Disclosure: this is a sponsored post by Blue Print Social and Plaid. I was compensated for my time in creating a craft, writing, photo styling & editing. All opinions shared are mine. And, for some more Plaid inspiration you can check some other ways bloggers have used these products! So, so pretty! I’m sure your hostess will love it! This is great! Just in time for some Christmas presents and who couldn’t use a gift card. I love the spoons! What a fun idea!